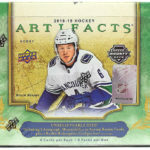 Artifacts was slated to coincide with the beginning of the 2012-13 NHL season. But we all know how that went. (For those of you reading this blog post 30 years from now, the 2012-13 season was delayed by a 3-month lockout.) 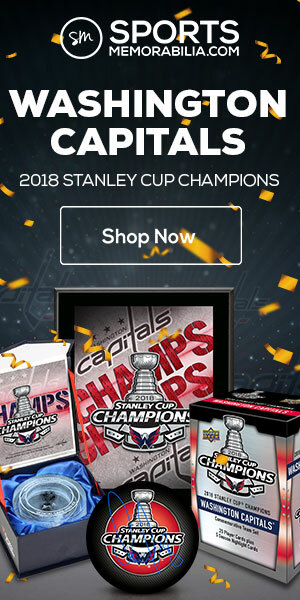 Other than the rookie redemption cards, the labor dispute didn’t really have much of an effect on Artifacts, which is laden with current and former star players, as well as three memorabilia hits per box. Each box contains 10 4-card packs and costs around $100. 29 base cards – This year’s artifact base cards have a minimalist design–relatively speaking, of course. 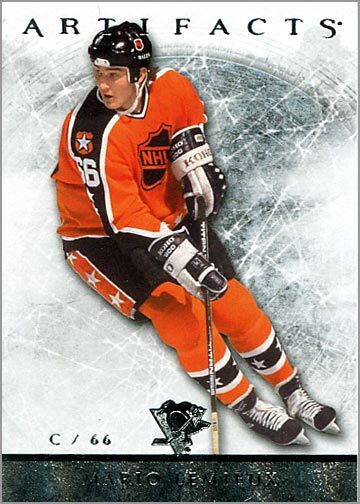 A colorful action photo of the player is “cut out” and superimposed over an ice background. At the bottom is the player’s position, number, team logo and name, all in shiny foil. The card backs carry 5 years of statistics, vitals, a short paragraph and another color photo. 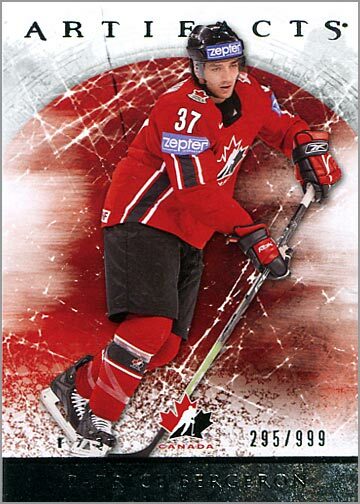 2 Short Print veteran cards numbered to 999 – Simon Despres and Patrice Bergeron are shown in Team Canada uniforms, but many of the short-printed veterans depict players with their NHL teams. The Team Canada cards give Artifacts some variety. 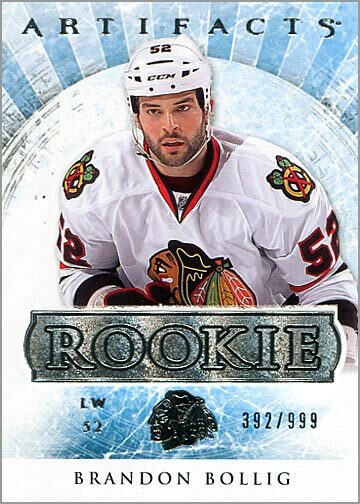 2 short-printed Rookie cards numbered to 999 – Casey Cizikas and Brandon Bollig. 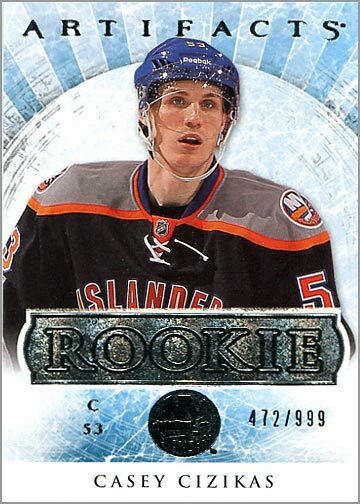 1 blue short-printed Rookie card – This card swaps out the silver foil for blue foil, and is serial-numbered to 85 copies. 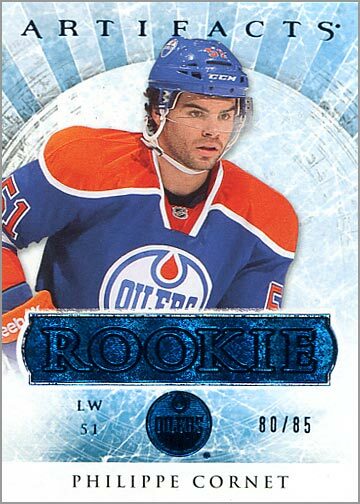 1 Rookie Redemption Card – Who will it be? Guess we’ll know in 2014, right? 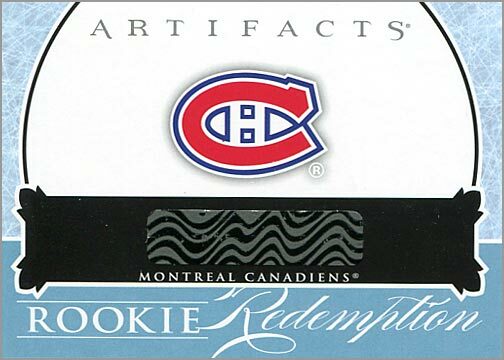 Upper Deck will honor the redemption cards, but we’re just not sure who it will be good for. I see a Canadiens’ logo, so maybe this will be for Milwaukee native Alex Galchenyuk. Maybe…(fingers crossed). 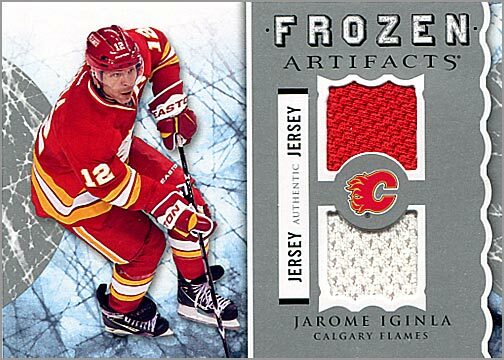 Frozen Artifacts Jarome Iginla dual jersey card – One red swatch and one white swatch. Nice. I don’t understand why Upper Deck sometimes puts two swatches that are the same color of the same player’s jersey on the same card. 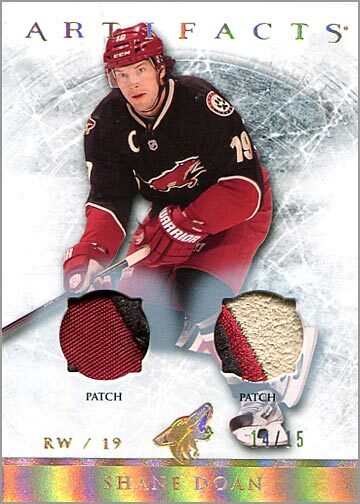 Shane Doan dual-patch card numbered 14 / 15 – It looks like both pieces of patch are from the Coyotes’ main logo. 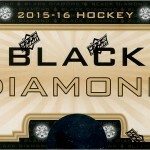 This resembles a base card, but replaces the silver stripe with gold holographic foil and is obviously much thicker. 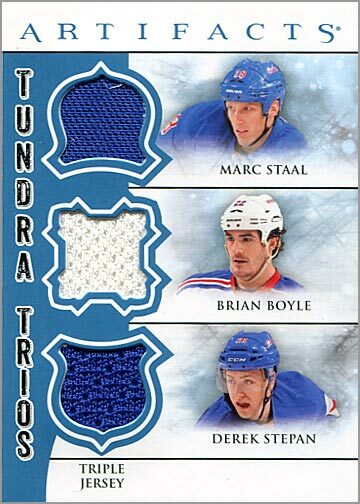 Tundra Trio New York Rangers / Marc Staal, Brian Boyle & Derek Stepan – I’m not a Rangers fan, but this card would have looked even better if one of the blue swatches was replaced with a red one. 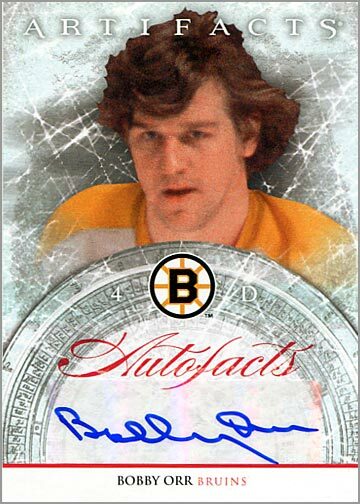 Bobby Orr autograph – The good news is that it is Bobby freakin’ Orr. The bad news is that his autograph is signed on a sticker that has later been applied to the card. 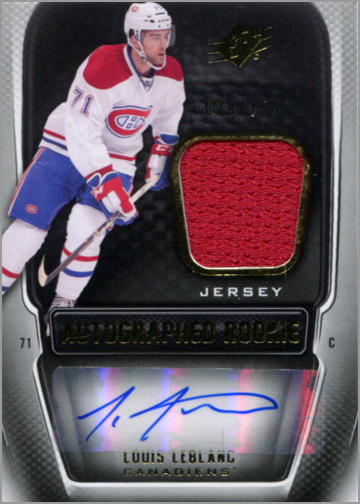 Not the end of the world because the sticker doesn’t stand out like a sore thumb–and it was put on straight, unlike this Louis Leblanc jersey card I pulled last year. 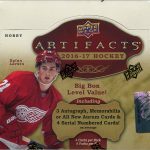 If jersey cards are your sort of thing–they aren’t really mine–then a few boxes of Artifacts might be a fun break. The base set design is sharp, and all the memorabilia cards seem to have at least two pieces on them. Colour me jealous! Nice box. 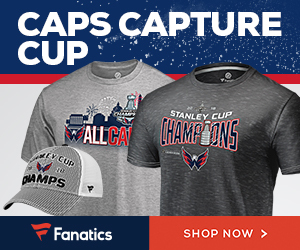 What Goalies did you get? 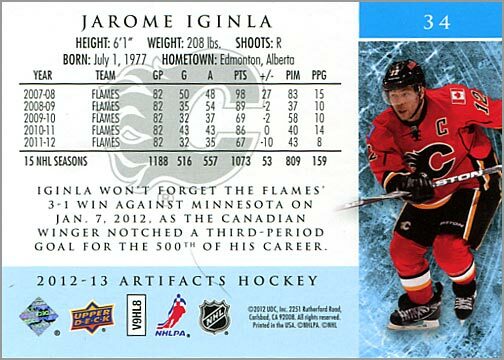 The goalies were serial numbered out of /999. A insert set I am trying to put together. This is still a pretty good hit box for being a free review box. I did not get any goalies in this box. Nice! 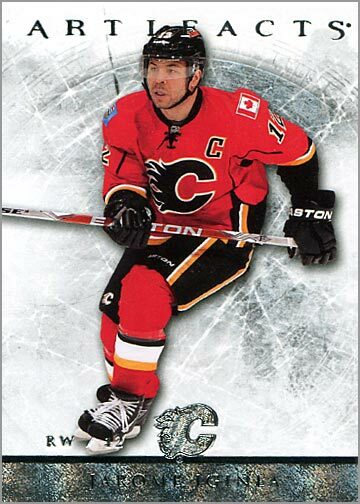 That is one sick Doan card! And I am a Rangers fan, so that is another phenomenal card(but as you said, a red swatch switched with one of the blue ones would have been better)! And you can’t beat an Orr auto. Very, very nice! 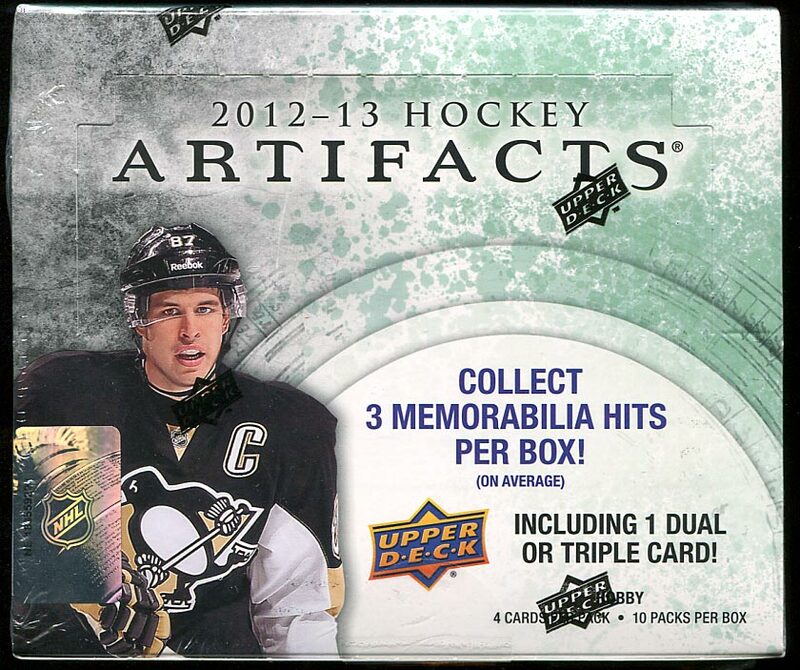 i just pull out a black signed Sidney crosby yesterday, 2/5 what a feeling!!! That is awesome. Nice card.